In April 2005 I joined my husband for the weekend while he was on a business trip in Des Moines, Iowa. We took a 4-hour drive down to Nauvoo, Illinois to see the newly rebuilt Nauvoo Temple and other LDS Church History sites. As we drove toward Carthage, Illinois I took another look at the map. I noticed that the same road we were on (in the other direction) would take us near the little town of Novinger, Missouri. I had heard of Novinger all the time while growing up. My interest was perked. I quickly pulled out my cell phone and called my Grandma Pat Davidson. I learned that Novinger was indeed her home town and that she had gone to high school not far from there in Kirksville. We decided to take the scenic way back to Des Moines. When we got to Lancaster, Missouri (about a 2 hour drive from Carthage) we saw a sign that said, “Kirksville, 23 miles.” It would be another 6 miles beyond that to Novinger. We figured the round trip would add another hour to our trip and it was getting late. Des Moines was another 2 hours away. We just couldn’t fit in the travel time. 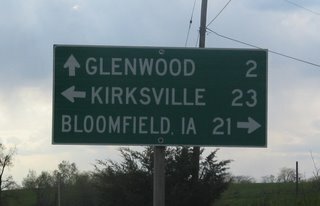 We snapped a picture of the sign and headed back into Iowa, thinking that I would never get another opportunity to see Novinger. 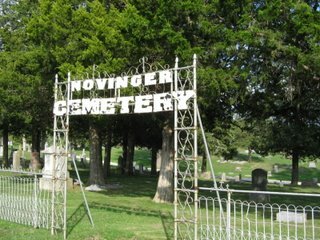 Novinger, Missouri holds a special place in my family history beyond just being my grandma’s home town. Just before my grandmother’s senior year of high school she and her mother (my Great-grandma Fleta May Schott) went to a movie about the Mennonites. This sparked an interest in other non-“main stream”-Christian religions. They spent that summer at the library and looked up everything they could on the Mennonites, the Seventh-Day Adventists, the Quakers and the Mormons. It was about this time that a set of Seventh-Day Adventists missionaries knocked on their door. They invited them in and found the information to be interesting and the discussion with them was enjoyable. Then about a week later another set of missionaries knocked on their door. They introduced themselves as Mormon (LDS) missionaries and, like the previous set, they were invited to share their message. In those days the Mormon missionaries left tracts with messages rather than giving a formal lesson. My great-grandma had noticed that on the bottom of these tracts were references to the B of M and the D&C and the P of GP. On about the 3rd visit she told the missionaries, “How am I supposed to learn all about your religion when I don’t even have these books?” The two missionaries nearly fainted. They had never had anyone ask for everything at once. These missionaries promptly gave them copies of the Book of Mormon, the Doctrine and Covenants and the Pearl of Great Price to go along with their own Bible. Let me pause to give a little background on the two missionaries who came to their door. Just prior to knocking on my great-grandparents’ door they had complained to their mission president that they had worked and worked, knocking on door after door, in that area, but no one would listen. They suggested that the area be shut down so they could focus their efforts elsewhere. The mission president told them to try for three more months. If they couldn’t find anyone interested in their message by the end of that time he would take the missionaries out of that area. But if these missionaries had knocked on my great-grandparents door even one month earlier they might not have been received as they were. As my grandma and my great-grandma listened to the message from these missionaries each week my Great-Grandpa Schott would sit in the other room and listen, but not participate. As they listened they found something very different about this religion. But my great-grandpa was still not interested. His argument against the church was that it would be just too hard to live by. He just couldn’t do it. My grandma and her mom set a date to be baptized into the Mormon Church. As they were getting ready to leave, on the date of their baptism, my great-grandpa told them to wait for him. He said he might as well join them in being baptized. He would just have to do his best to live up to its teachings. On March 24, 1940 my Grandma Davidson and both of her parents (Fleta and Glenn Schott) were baptized members of the Church of Jesus Christ of Latter-day Saints. My first memory of my great-grandparents is seeing them as they got off a plane in Salt Lake City. They had just served as LDS missionaries in Australia. They brought back boomerangs and toy koalas. So, how did they end up in Salt Lake? After my Grandma graduated from high school she came to Salt Lake to get her training as a nurse. In the mean time my Grandpa Davidson (who grew up in Salt Lake) got his call to serve as an LDS missionary in the Central States Mission. This included Novinger, Missouri. Ever since they had joined the Church, the Schott’s had taken an interest in the missionaries. They often took the missionaries on the two hour trip to Nauvoo. On one particular Thanksgiving they had invited the missionaries, serving in their area, to have the dinner with them. My Grandpa Davidson was, of course, one of these missionaries. My grandma (Pat Schott, at the time) was home to see her parents for the holiday. And that is where my Davidson grandparents met. 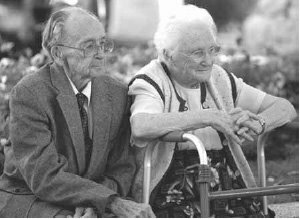 After he returned from his missionary service he looked her up and in January 1945 they were married. Here is a picture of my Davidson Grandparents from the Ensign in November 2004 page 103. Sometime in the interim my great-grandparents moved to Salt Lake where he would later serve as a Bishop in the old McKay Ward near Liberty Park in Salt Lake City. It has now been about 20 years since my great-grandparents passed away. But not before I got to know them really well. In their later years they lived about a mile from my house. They had moved to Kearns (on the west side of the Salt Lake Valley) because of failing health so their daughter could take care of them. As a young college student I would often stop by to see them on my way home from my classes. They always had those chocolate orange sticks on a lamp table in their living room. My great-grandma tried to teach me how to tat, but I was never very good at learning how to make that shuttle fly the way she could. Less than a year after the passing of my Great-grandpa Schott in September 1986 my Grandma and Grandpa Davidson were headed to serve as missionaries in England and Wales and I was on my way to serve a similar mission in Virginia. Then in early October 2005, six months after my attempt to see Kirksville and Novinger, I set foot in that small rural northern Missouri community I had heard about all my life. I stood with my Mom and brother Henry in the Novinger Cemetery (where many of my ancestors are buried). We were on a return trip across the country after picking up my brother. He had just completed his own missionary service in West Virginia. There are now two LDS Wards (congregations) in Kirksville, Missouri. While growing up, Novinger Missouri was a vague concept in the back of my head. I felt no real attachment to the place. But God has a way of showing you what He really wants you to see and turning hearts to our fathers and grandfathers and great-grandfathers. I never really knew how my mom's side of the family joined the church, i knew it was through the schotts, but other than that, nothing. Thanks.